Once again the rains have returned to the hills and valleys of southern Oregon, blessing us with crystal clear air, vibrant fall colors and trickling springs and streams. Perhaps due to my northwest roots, I never lose appreciation for a comforting blanket of morning clouds or the sound of pounding rain on the barn’s metal roof. The rains nourish the soil and plants, and at the same time renew our own spirits for the beginning of another year and exciting new projects to come! 2015 was a year of great challenges, and yet due to an extremely positive and productive crew and supportive community the Farm had its best year yet. For the third year running, southern Oregon was hit with extreme drought and heat, leading to our most limited irrigation season ever, and several weeks of wildfire smoke in August. 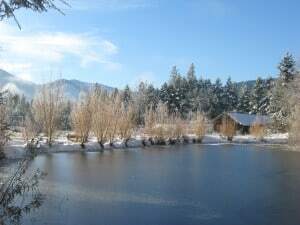 In addition, our local water official informed us that our decades-old pond was never properly permitted by previous owners of the property and thus requires over $1,000 in fees and permits. Finally, our summer intern was forced to cancel her internship on day one due to family problems. 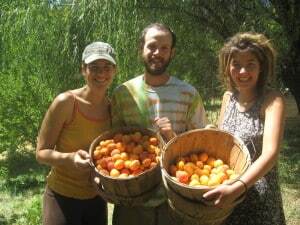 In response to these challenges, we have renewed our dedication to drought-proofing the Farm and sharing these techniques through several new adult workshops next year. Additionally, our tireless crew of Brian Geier, McKenzie Woolley, Stephanie Magoon, Sarah Shea, Casey Wright and Nicole Kraft more than made up for any labor shortage by going above and beyond in their dedication to the Farm’s many programs! 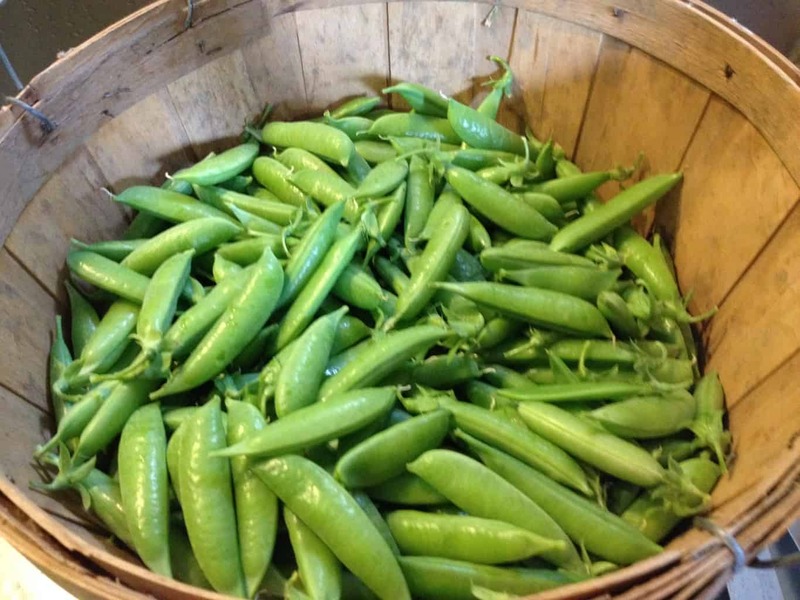 Thanks to the crew, abundant sunshine, and well-metered irrigation, the farming season was extremely productive, with great harvests for the Farmer’s Market, Community Supported Agriculture (CSA) program, seed contracts, and our local food bank. Our children’s education programs were also very successful, as highlighted by our growing partnership with College Dreams (see page 3). 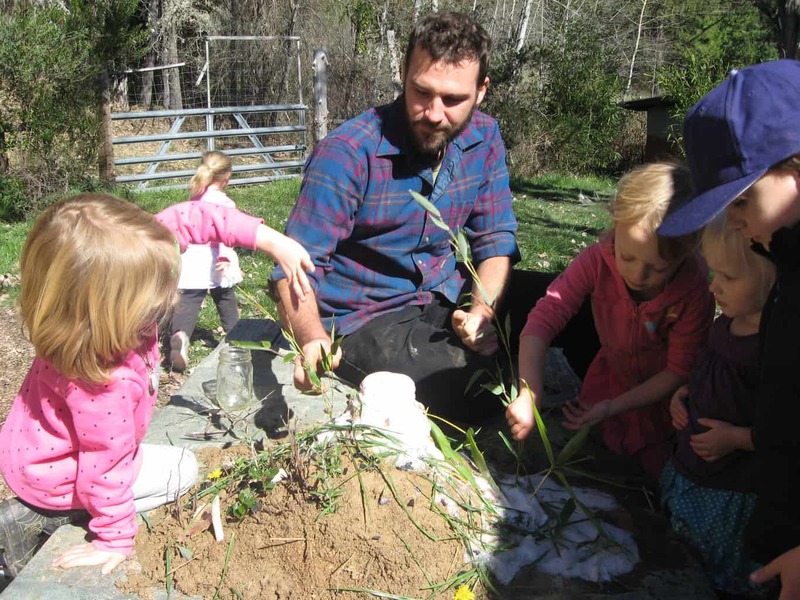 Education Coordinator Brian Geier oversaw an expanded preschool and overnight school-visit program that allowed more youngsters to spend quality time at the Farm. One highlight of the season was an overnight visit from the third grade class at Medford’s Madrone Trail Charter School in May. Twenty-five students spent their time harvesting and cooking from the garden, exploring the forest, tending the chickens and goats, and sleeping out in our new wall tents. 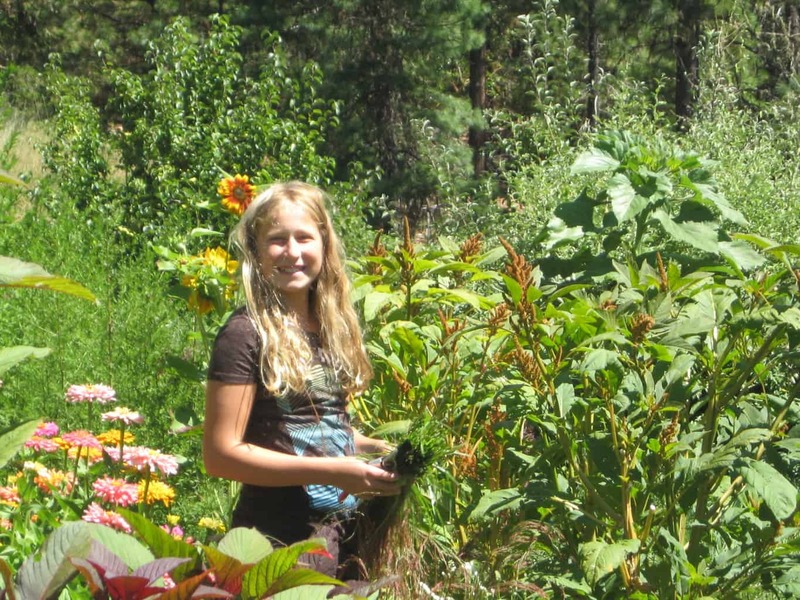 Summer Farm Camps were again a big hit with participants, and Spring and Fall school visits were offered to twenty classes from throughout the Rogue Valley thanks to our partnership with Rogue Valley Farm to School. Overall our children’s education programs continue to be the heart of our mission at White Oak Farm, and we are always gratified by the smiles, laughter and insight that children bring to the Farm each day. As the farming and education seasons come to a close, I find myself extremely excited thinking about the year to come and the great things in store for 2016. Thanks to several unexpected grants and donations and an energized staff, we are embarking on an ambitious program for next year. First, with the help of our former intern and local forester Josh Weber, we have begun a maintenance, bridge building, and signage project for our trail system. We are also planning to improve our education infrastructure by constructing covered outdoor eating and classroom spaces partially from poles harvested as part of the trail project. Our drought-proofing efforts will also continue with the installation of several new water storage systems and efficiency measures. 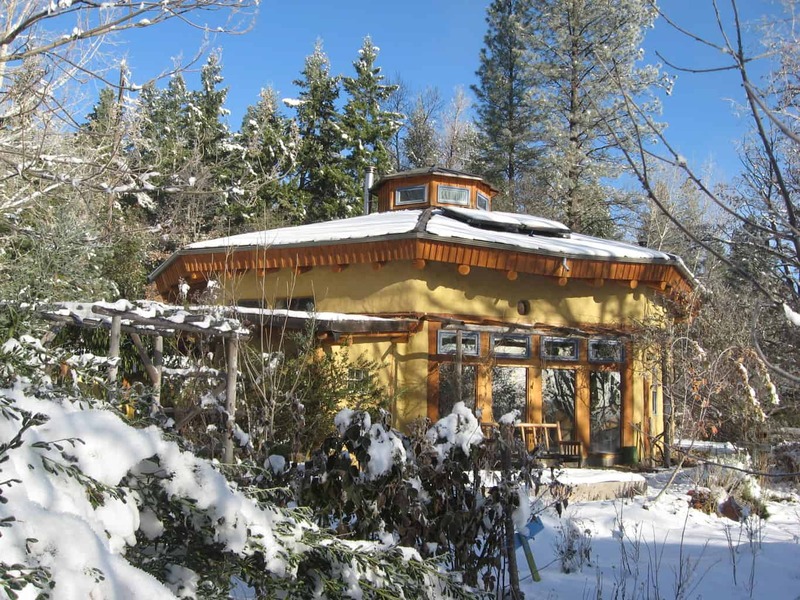 Finally, we are developing several new adult education programs, including a 12 day Permaculture Design Course in late March, and a sustainable living skills series to be offered throughout the year. Check out our website for updates on these exciting new programs! 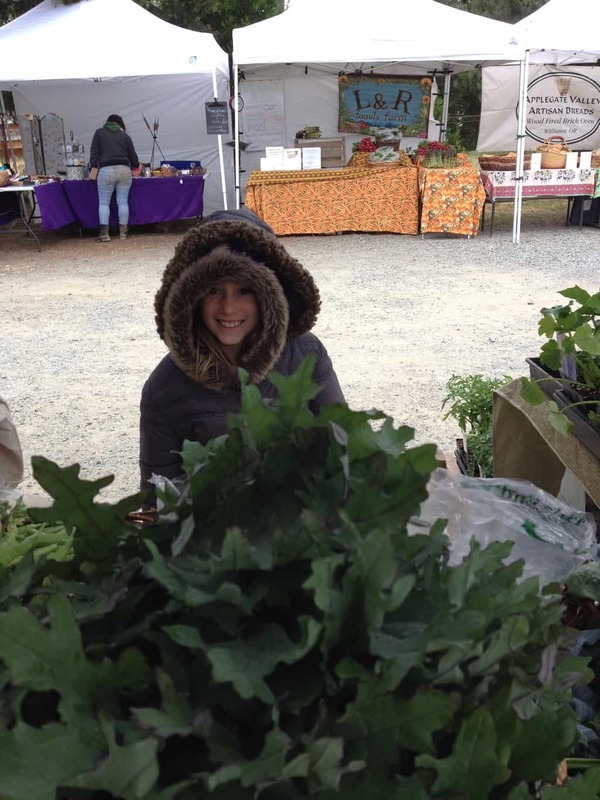 Spring has sprung in Southern Oregon and that means School Visits and Farmer’s Market Season. 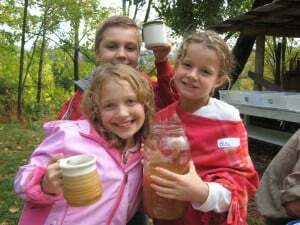 We are excited to welcome ten local schools out to the farm for Harvest Meal visits this April and May. 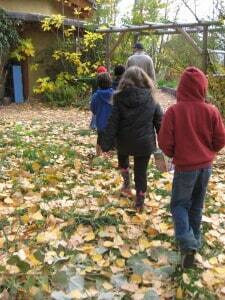 Thanks to a great partnership with Rogue Valley Farm 2 School, these visits are free to participating classes! The Williams Farmer’s Market is also up and running earlier than ever before thanks to abundant spring sunshine and warm temps. Local folks come check it out Mondays from 4-6:30 at the Williams Grange. 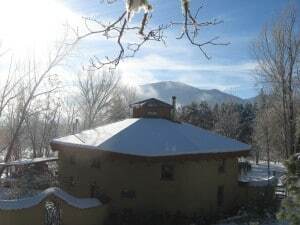 With the shift in the seasons from the frenetic energy and abundance of spring and summer to the wet and quiet days of fall and winter we at the Farm can again turn our thoughts to reflection on the year that was and dreams for the year to come. 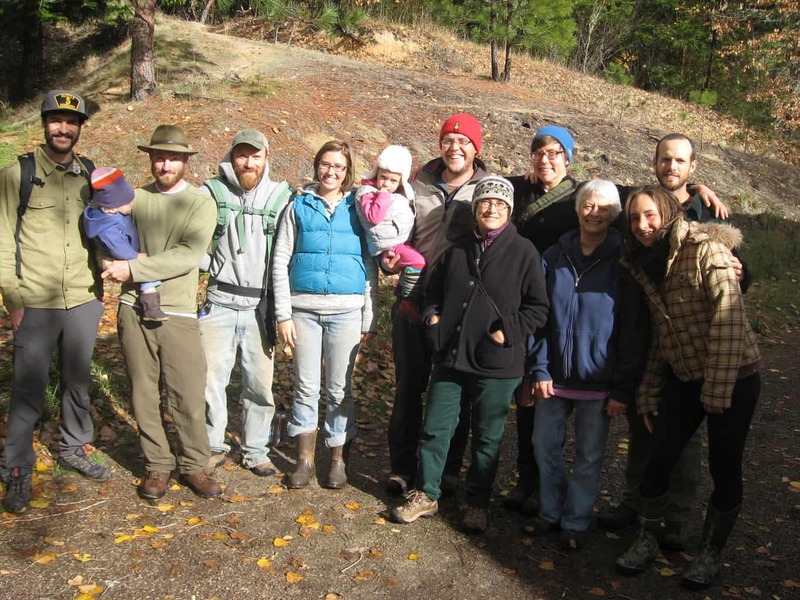 2014 was in many ways a year of pleasant surprises: despite a widely anticipated major drought we had a very productive farming season; our educational programs were supported by an unexpectedly large and stellar group of volunteers; and our Residential Education Infrastructure Campaign was fully funded and will be finished by the end of the year. 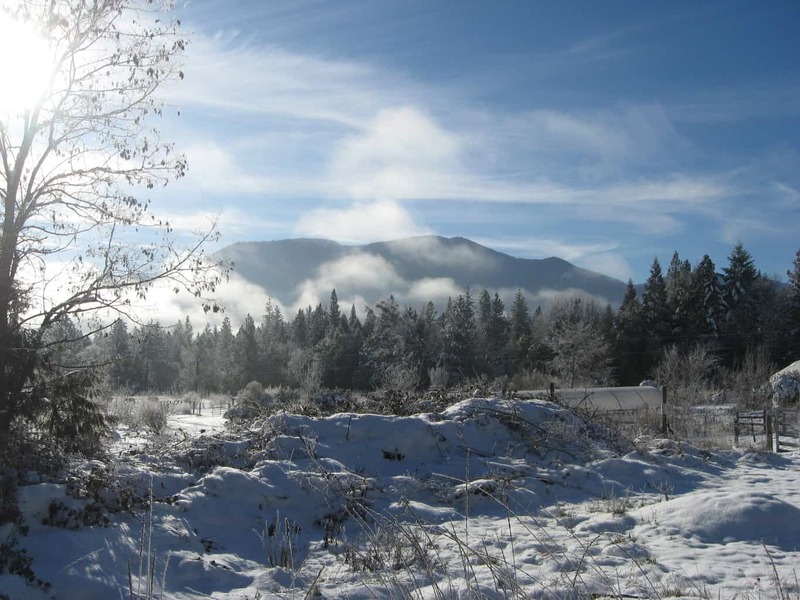 The year began with abundant sunshine and warm winter days, great for working outside in short-sleeves, but not so helpful in accumulating snow pack to keep the creeks flowing in our dry southern Oregon summers. As predicted the year was extremely dry by historical standards, forcing us to use all of our water-conservation techniques. These included: drip irrigation, early planting and harvest dates, crop selection, mulch, and careful monitoring of weather reports. Fortunately we were blessed with warm early spring weather that allowed spring plantings to get of to a fast start while the soil still retained winter moisture. Our Williams Farmers Market started three weeks early in May and ran straig ht through to Halloween with good crowds and enthusiastic support for our produce. Our cooperative CSA, the Siskiyou Sustainable Coop, which includes produce from White Oak and six other farms had its largest membership ever, with 240 families receiving a weekly box of produce from June-October. Perennial crops such as raspberries, pears, grapes, and strawberries also thrived despite the drought due to deep roots, mulch, and the resiliency of being well established. As the season came to a close, we experienced an unusually wet October, rekindling hopes for the return of plentiful moisture to our valley next season. One resource that was not lacking in 2014 was volunteers. Arielle Spayd, Lior Alon, Christine Evans, Paris Conwell and Casey Wright supported our Children’s E ducation Programs by helping to lead school visits, cook with pre-schoolers, teach summer campers, and even flip burgers and pour beer for our Fall Fundraiser. This crew was an immense help to Andrew and the rest of the staff in providing fresh energy and excitement for our record number of children’s programs in 2014. In addition to these volunteers, our three interns, Christina Lubarsy, Rion Glynn, and Danielle Purkey, were present throughout the year, eagerly leading children, harvesting veggies, manning the market booth with Sarah, and helping to keep the goats fed and milked. They each brought a unique and uplifting energy to the Farm that helped make the year a big success. Another element of our Education program that experienced a big boost this year was our Education Infrastructure. 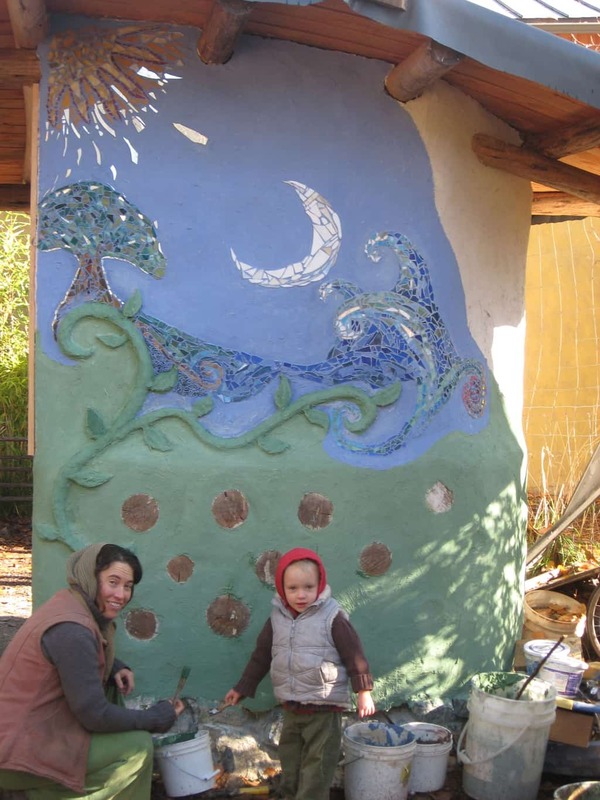 Started by former Co-Coordinators Dave Majzler and Julie Pacholik in 2013, the Residential Education Infrastructure Campaign included grant and donor funding for four new wall tents, hot water hand washing stations, drinking fountains, and upgraded indoor and outdoor kitchen facilities. These projects will be fully completed by the end of the year, and have already improved the experience of school groups and campers, while also allowing us to expand our residential programs to include greater numbers of children across a wider spectrum of weather conditions. Thanks to our donors, the West Family Foundation, and the Fourway Community Foundation for making this project possible! Every year is filled with ups and downs as the natural and human cycles of life on a farm ebb and flow. This year we were truly blessed with many high points and few low. I am continuously amazed at the bounty of the land, the brightness of the children, and the perseverance of our staff. Thanks to all who helped make 2014 a great year! Snow, record low temperatures and bright sunshine… winter is here! One of the biggest challenges of running any successful non-profit is funding essential programs. 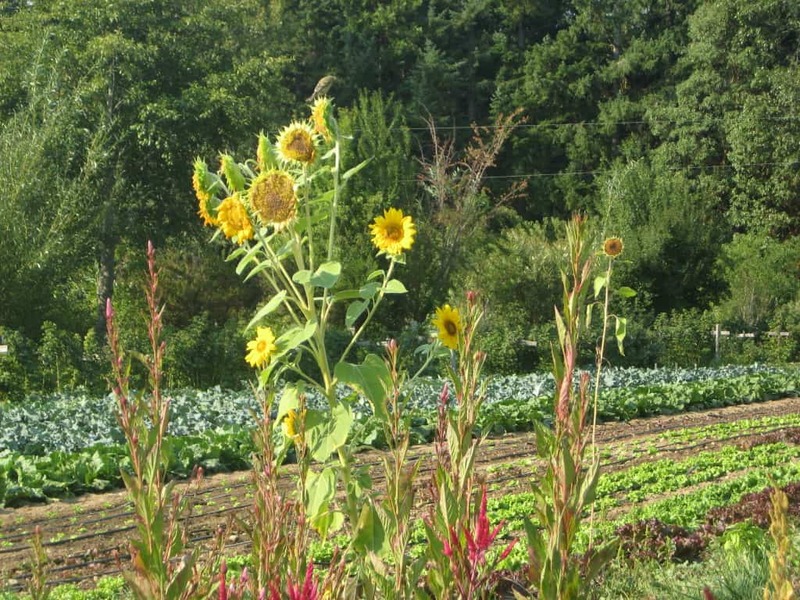 It is no different at White Oak Farm. Without a strong support network we would not be able to offer the programming we do. And, while the demand for our educational programming continues to rise (preschool, summer camps, school day trips, intensive 3-day-long school trips, adult workshops and internships), we continue to strive to reduce financial barriers that would otherwise prohibit potential participants. This year alone we received 10 applications for full or partial summer camp scholarships. Unfortunately, we were unable to help them all because of limited financial resources. This was absolutely heartbreaking, and it became clear to us that in order to make our programming sustainable we needed a consistent revenue source to fund scholarships. Hence, the first annual Fall Equinox Fundraiser! As we brainstormed ideas for the event, we realized we wanted it to be both a way of giving back to the local community and a way to raise funds to support our programs. We also wanted to make the event enjoyable and rewarding for children and adults alike. For the kids we had face painters creating wonderful characters and creatures, a farm tour that included stops to see all our fluffy and feathered animal friends, and of course kid-pressed apple cider from the apple press. Everyone enjoyed live music by Buzz and Friends and Franky Hernandez and the Old Soul Parade, a smörgåsbord of delicious farm-fresh appetizers, and Mexican inspired entrées by Cocina 7. For the adults, we had a bar stocked with local beer and wine and a silent auction filled with over 50 unique, thoughtful, and useful items. 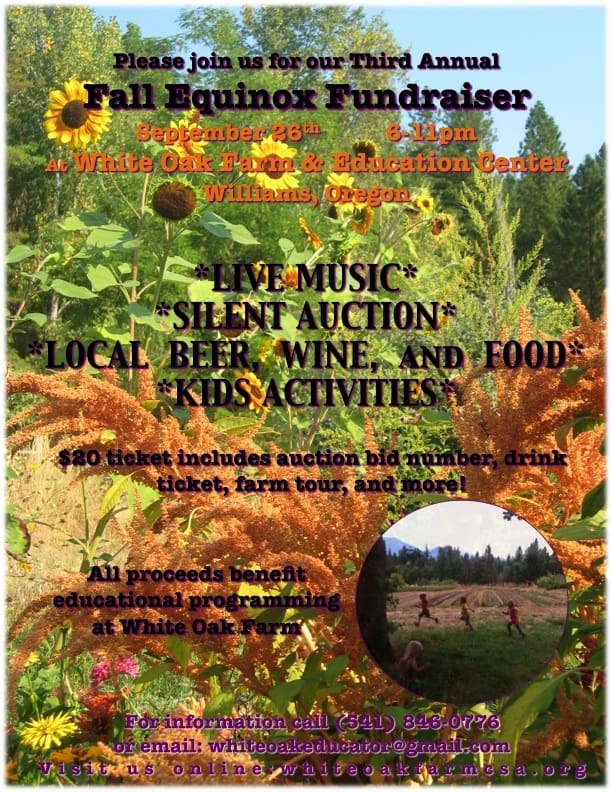 All in all, the First Annual Fall Equinox Fundraiser was a smashing success due to the generosity of donors and volunteers as well as the enthusiasm and openness of guests at the event. In the end we were able to raise over $3000! With these crucial funds, we will be able to open the Farm gates to children and schools who would not otherwise be able to participate in our programs. 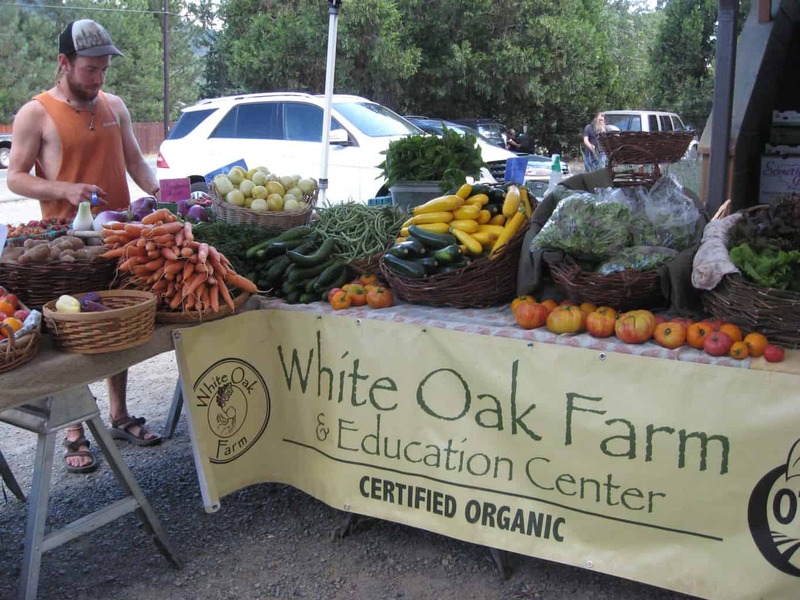 Furthermore, by demonstrating to foundation grant committees that White Oak Farm & Education Center has the support of our local community, we stand a better chance of receiving future grant funding. All of us at White Oak cannot thank the volunteers, donors, and community members enough for a fantastic event. The work done here is not ours alone, we share it with all of you working to make this world abetter place. 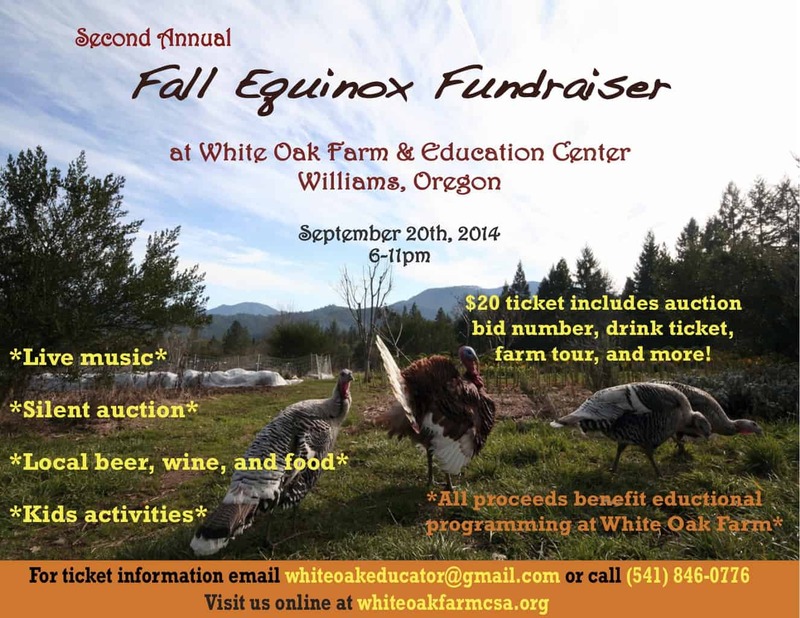 We cannot wait to see you all next year at the Second Annual Fall Equinox Fundraiser! Former intern Josh Webber with the winners of his donated auction item: A guided Hike through the White Oak Forest Trail system. The cob farm stand at White Oak is almost finished thanks to a final plaster and mosaic being applied this fall. 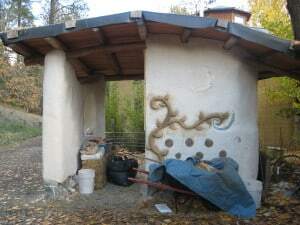 The structure was started during a natural building workshop in 2011, and was created from the foundation up by participants and folks here at the Farm. It has served as a space to sell milk, eggs and produce, and as a beautiful entry to the Farm. The stand has been functional for two years, but to my artist’s mind was never quite complete. With late fall upon us I finally found tim e to complete it. With a few tools, stained glass, wheat paste and natural plaster, I set to work. 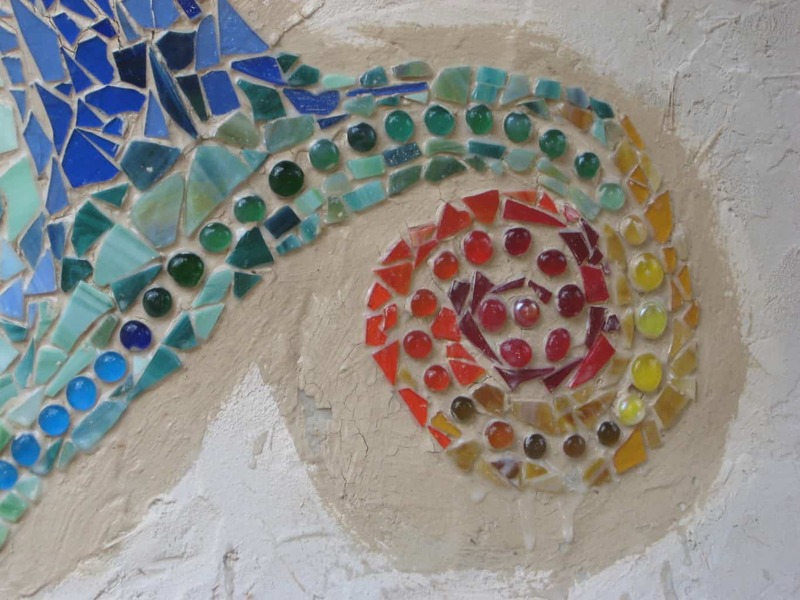 I have never seen stained glass set onto natural plaster, but trusting my intuition, a beautiful piece of art was formed. The simplicity of this technique is amazing, and it showed me that with a few ingredients, anyone can transform a blank wall into a piece of art. From past projects I had a large tub of broken stained glass (which can also be obtained in bulk for quite cheap from a stained glass store). I had my blank canvas, which was a cob wall that had been plastered with white natural plaster (making the glass easier to see). 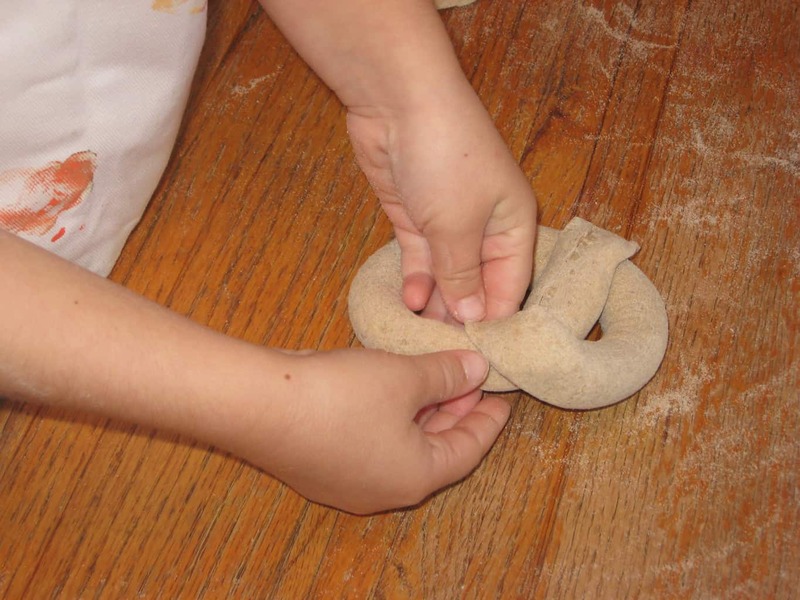 I made a batch of wheat paste, which is a simple mixture of white flour and water, and I mixed a little white sand and white clay into it to thicken it. All I needed now was time, which can be tricky with a 2 year old. 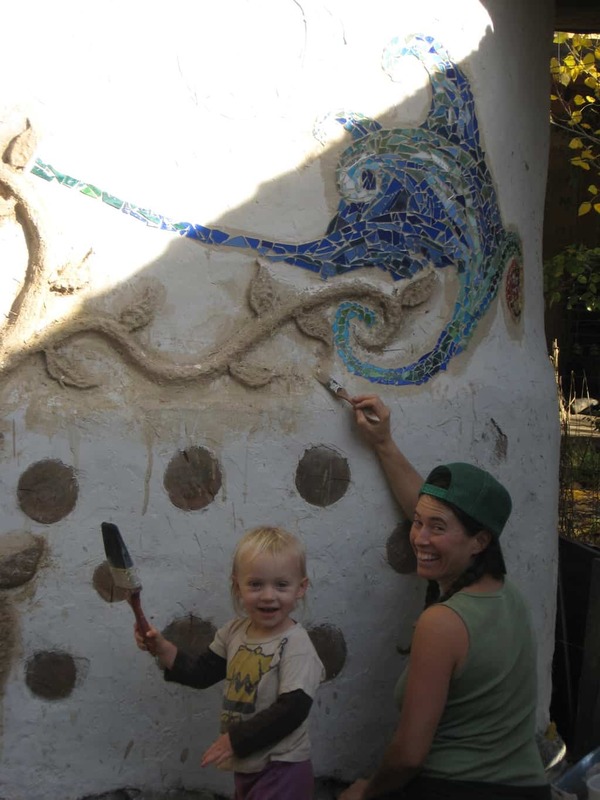 Amazingly, she was as excited as I was to work on this project, and did an incredible job making her own mosaic! We broke up the glass into smaller pieces and used the paste as our adhesive. Slowly, a picture was formed. The glass held quite tight to the plaster, and I went over it with plain wheat paste to complete the binding process. Once the picture was completed, I made a batch of natural paint, which is a thinner version of plaster with less straw and an added natural dye of blue pigment. My daughter helped me through every step, making the paste, picking out the glass, and painting it. It was beautiful to be able to create art with her, and showed me that at nearly any age children are ready to be creative. The farm stand is not quite done in my mind, but we are a step closer to completion! A new season is upon us in Southern Oregon with rain in the skies and leaves on the ground. Chanterelle and Matsutaki mushrooms are fruiting in the forest and peas and oats are sprouting i n the farm fields as we reflect on 2013 and look forward to a new year just around the corner. This year was filled with many challenges, especially the effects of three weeks of heavy wildfire smoke during the middle of our farming and farm camp season; yet in some ways the obstacles made our successes that much sweeter. One of the highlights of the year was the stellar performance of our experienced and dedicated staff. Dave Majzler and Julie Pacholik returned for a second year of directing children’s programs, Andrew Simmons and Kristy Newell returned as volunteers after completing the internship program in 2012, and our new interns Casey Wright, Jewels Daly, Madison Rudd and Christine Evans hit the ground running in their first year on the farm. This group made farming fun and productive, and we again had a great year of producing fruits and vegetables for the local community through the farmers market and CSA programs. 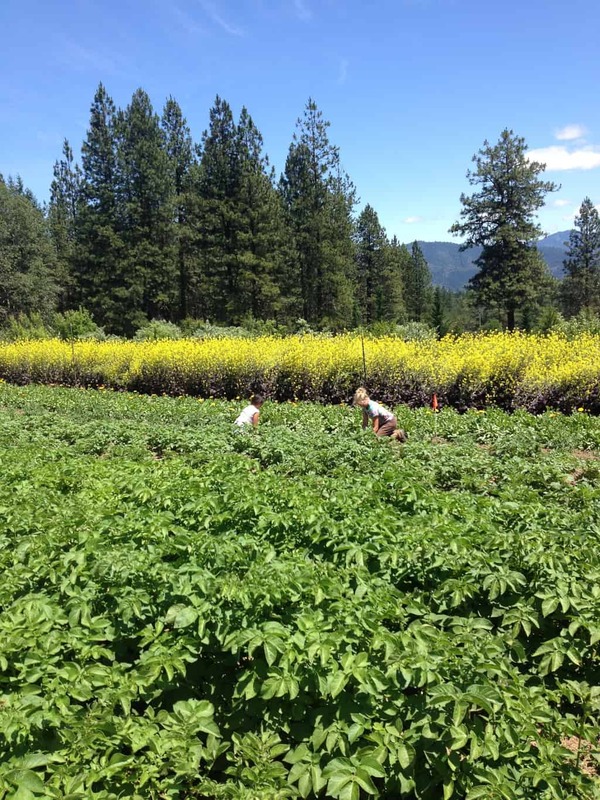 Sarah Shea Starr added to our agricultural diversity by planting a greenhouse full of Hawaiian ginger, which proved a surprise and a treat to customers and farm visitors alike. The children’s education program blossomed this year under the passionate direction of Dave and Julie. 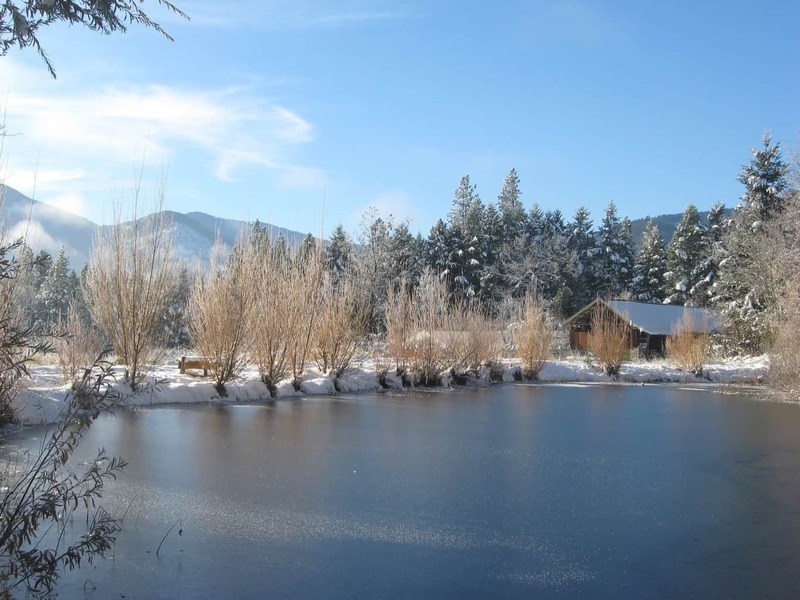 The farm hosted 20 elementary school visits, 17 weeks of preschool for eight local 3-5 year-olds, two week-long camps, as well as residential programs for “at risk” youth from Grants Pass and high-school students from Portland. and the Portland Waldorf High School. School Visits were offered for the second year in partnership with Rogue Valley Farm to School, an amazing Ashland-based organization that helps connect farms and schools all over southern Oregon. 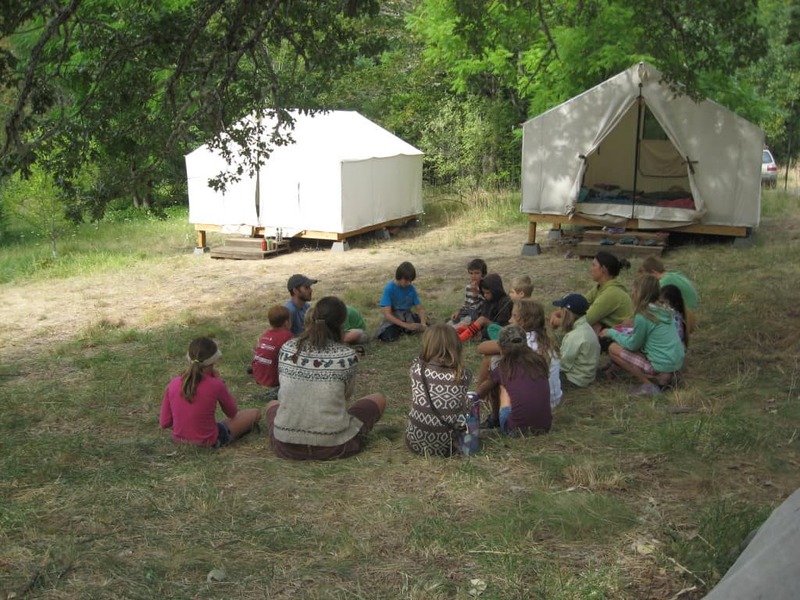 Summer Farm Camps were also a big hit with participants, though we were sadly forced to cancel a farm camp in A ugust as a result of unsafe air quality due to wildfire smoke. We apologize to the families that missed out on a week of fun on the Farm. However, our education programs still served more children in 2013 than in any other year. In other farm news, we planted new raspberry beds, improved signage in our children’s garden, finished the cob farm stand, expanded our goat milk and cheese production, and raised a healthy flock of turkeys. 2013 has been a wild ride, and one that we will not soon forget. Thanks to all who helped make it a big success! Seeing a child experience the farm for the first time is a remarkable thing. A bustling energy permeates the farm and the sounds of children sweep across the fields. The joy in their eyes as they see a turkey show off or their giddy, nervous laugh as they dig their fingers into the soft wool of a sheep is profound and beautiful. The taste of a mid-summer strawberry, picked right from the plant is a transformational one. These memories stay with them, and the ideas last longer than their time on the farm. Of course, as educators, we can never know the full impact the farm has on a child. However, our intention is to plant a seed of connection and respect towards the natural world, one that needs to be nourished and fed. We understand that a single field trip may not change the course of a child’s life forever. But we can foster this relationship by inviting children back during multiple seasons or by playing the important role of planting that first seed. 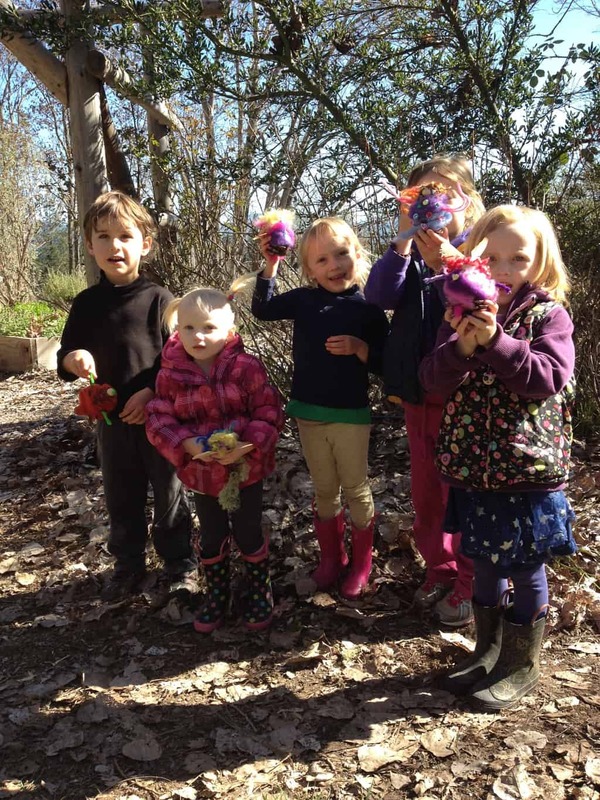 We hope the experiences children are given at the Farm act as a springboard for later in life, and that they will grow up to be politically engaged citizens, farmers and gardeners, natural builders and cooks. These are the children who respect the earth, who tend the land, and have the strength to speak when they feel the earth needs to be spoken for. This season was a banner year for children at White Oak Farm and Education Center. We taught preschoolers to high schoolers, hosted daylong trips for elementary children and led two week long overnight summer FarmStays. Perhaps the most inspiring and transformational of all was the three day, overnight program for the agriculture class from Illinois Valley High School. We tutored students in the curriculum and techniques we use at White Oak Farm. 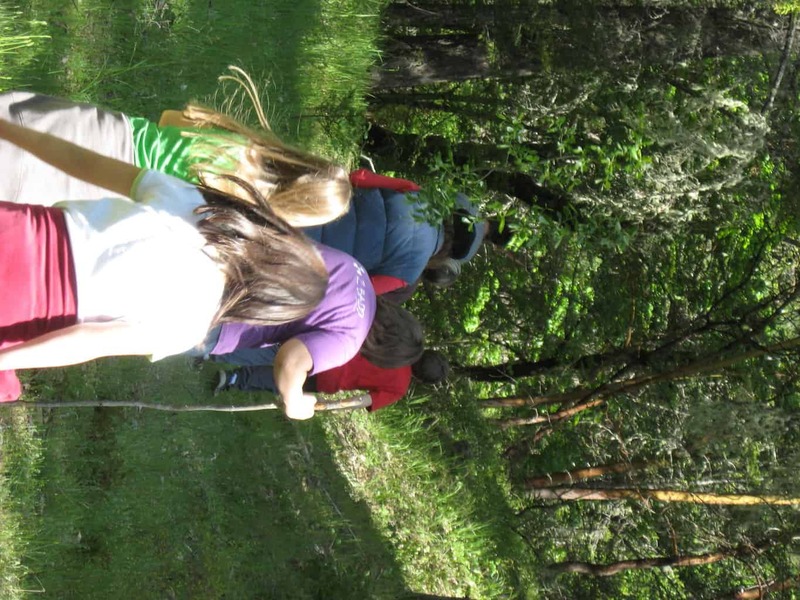 The culmination was on the third day when a 2nd grade class from Madrona Elementary came for a field trip. The high school class led and taught the entire trip. Students of all ages flourished and were energized by the experience. The 2nd graders left reluctantly with turkey feathers in hand and the high schoolers left, shortly after, saying good-byes to their new farm family. The impact we made is no doubt a long lasting one, something that will shape the high schoolers for years to come. 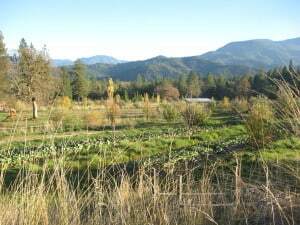 We are also extending our farm family with the help of Rogue Valley Farm to School. Starting this spring, we met with the talented staff of RVF2S to combine forces and educate more children from across Josephine and Jackson counties. 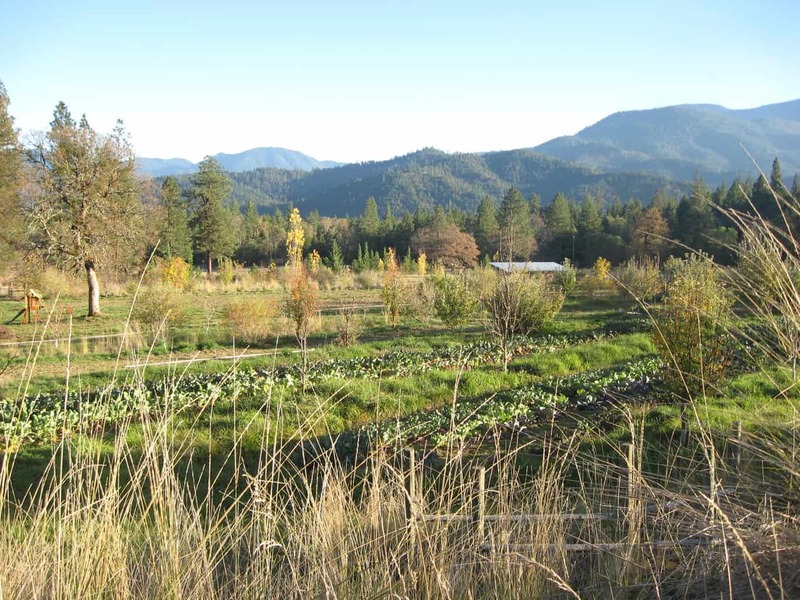 Rogue Valley Farm to School’s signature field trip is the “Harvest Meal” in which children come to the farm to harvest and prepare a multi course lunch. This fall we hosted ten of these Harvest Meals. The students prepared meals of freshly made garden vegetable pizza and salad or winter squash soup with salad and fresh baguettes. Along with Harvest Meals, RVF2S also connects local farms with schools to provide fresh, local produce to cafeterias and has recently started growing school gardens in several school districts. We are overjoyed to be working with this incredible non- profit and we look forward to years of shared growth and learning. 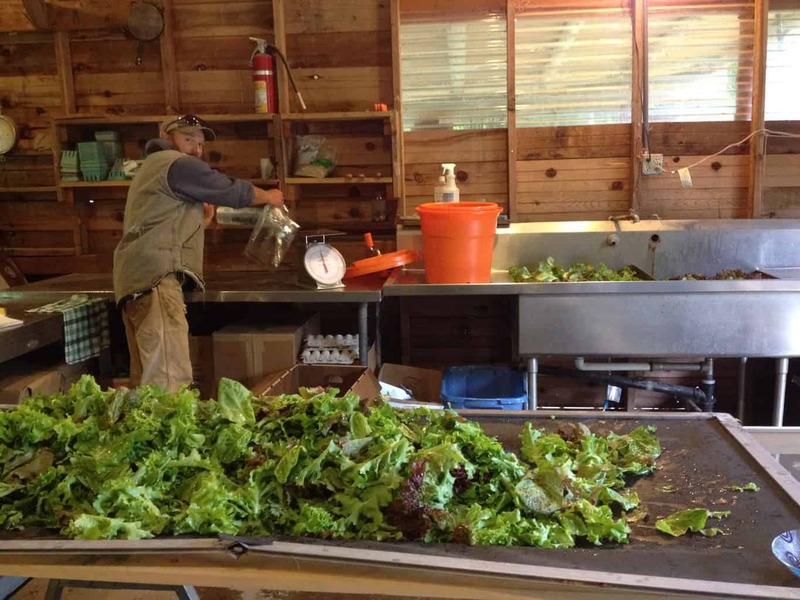 Whether it be a Harvest Meal, a high school overnight trip, or Summer FarmStay, here at White Oak Farm and Education Center, we feel incredibly grateful to be a part of these experiences and transformations. We cherish the delighted laughter next to the cider press, the deep concentration on a child’s face as she tries to catch a tree frog for the first time, and the incredibly poignant questions during the farm tour. These memories will warm our hearts long after the last child has left the farm in fall, and even after the first snows of January signal the beginning of the next year of children on the farm.